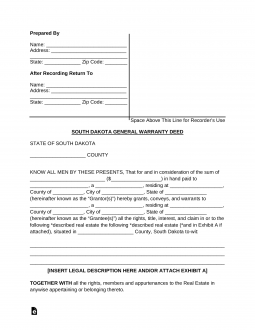 The South Dakota general warranty deed is a document that transfers the ownership of real estate in fee-simple and title without liens or encumbrances. The form must match the statutory form and contain the statement that the Grantor (seller) “grants, conveys and warrants to” the Grantee (buyer) the described real estate. It is important to include the property’s full legal description consisting of the Book and Page numbers, Tax Map and Lot numbers, and any Parcel ID (if any). Certificate of Real Estate Value (§ 7-9-7) – Must accompany the Warranty Deed when filing. Recording (§ 43-28-1) – All forms are to be filed with the Register of Deeds in the proper jurisdiction of the property. Signing (§ 43-25-26) – Must be signed by a subscribing witness or a Notary Public.